The Board of Water Supply is asking residents from Ko Olina to Makaha to conserve water after a main supplying most of the water to the Waianae Coast broke yesterday afternoon. The break, on Farrington Highway near the Ko Olina overpass, was reported at about 12:55 p.m. It brought traffic to a standstill yesterday as water poured into the Ko Olina area while crews contra-flowed lanes in Ko Olina to locate the main. No residents or businesses were affected. However, residents should use water for only essential uses to keep the reservoir water levels high, said BWS spokeswoman Moani Van-Wright Alst. The 24-inch main is the same pipe that broke near the Kahe Power Plant in June, cutting off water to 12 homes for a few days and affecting thousands of residents on the Leeward Coast. The main, which is about 46 years old, supplies about 60 percent of water flowing into the area. A plastic bag full of fabric clogged an 8-inch sewage pipe on Wilhelmina Rise yesterday morning, causing about 8,050 gallons of waste water to overflow into nearby catch basins and dry drainage canals. Some sewage from the manhole, at 1432 Wilhelmina Rise, flowed into the Pueo Street canal, which leads to the Kahala beach area. However, city officials believed it did not reach the beach. As a precaution, city officials posted signs along the public access to the drainage canal warning residents not to enter the area. Crews from the city's Environmental Services Department responded to the break and stopped the flow within 22 minutes, according to a city news release. Lava from Kilauea Volcano continued to flow yesterday, with the most active areas along earlier Kupaianaha flows southwest of Puu Kiai. Eastward flows advanced in areas north of Puu Kiai, the U.S. Geological Survey reported. 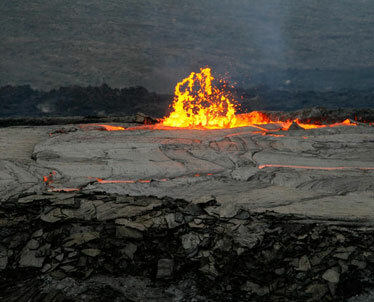 In this photo, taken Friday, lava spatters in one of the channels. "Discovering the Big Bang" will be the topic of a free public lecture by P.J.E. "Jim" Peebles, Albert Einstein professor of science emeritus at Princeton University, at 7 p.m. Thursday at the University of Hawaii's Campus Center Ballroom. Peebles' lecture is part of the UH-Manoa Distinguished Lecture Series. He also will give a specialized talk at 3:30 p.m. tomorrow at the Institute for Astronomy on "Galaxy Formation: Successes and Challenges for the Standard Cosmology." Peebles and Princeton colleague Robert Dicke predicted a faint glow of radio emission would result from the universe's birth, or big bang. Their theory was confirmed with the accidental discovery in the 1960s of cosmic background radiation, and Peebles led a debate over where and how much dark matter exists, according to the Hawaii Institute for Astronomy. "Thanks in large part to Peebles," it said, "we now understand that dark matter played a crucial role in the development of structure in the universe, and hence a crucial role in creating the conditions for life." "The Ice Ages of Mars" will be the topic of a free Hawaii Space Lecture at 7:30 p.m. tomorrow in Room 544 of the Pacific Ocean Science and Technology Building, 1680 East-West Road. Norbert Schorghofer of the NASA Astrobiology Institute, University of Hawaii, will describe changes on Mars from extensive ice deposits 3 million to 5 million years ago. For more information, call 956-3132 or see www.higp.hawaii.edu/prpdc. The Honolulu Fire Department helped recover two bodies yesterday. Firefighters received a call at about 4:35 p.m. yesterday from a resident who said a body was in the waters of Lake Wilson in Wahiawa near his or her home, said Fire Capt. Earl Kealoha. About an hour later, at 5:30 p.m., firefighters using a helicopter recovered a body located about 20 feet below the Diamond Head Lighthouse, Kealoha said. The Honolulu Medical Examiner's office said both male bodies had not been identified and were decomposed. Police classified both cases as unattended deaths. No other information was immediately available last night. A 72-year-old Waipahu woman remained in critical condition yesterday at the Queen's Medical Center with injuries sustained when a pickup truck accidentally reversed into a fence, which landed on her. An 11-year-old Waipahu boy, driving the family pickup truck under his father's supervision, reversed out of his driveway and into the fence Saturday evening. Police said that shortly after 6 p.m. the pickup truck reversed out of a driveway and ran over the boy's father, 42, whose right foot and leg were injured. The truck kept going until it slammed into a wrought iron fence atop a hollow tile wall at 94-1211 Huakai St. The boy's father was treated at Kapiolani Hospital at Pali Momi and released. A 20-year-old Waimea man was killed in a car accident early yesterday when two vehicles were apparently racing in North Kohala, police said. Big Island police said two trucks going north on a two-lane stretch of Akoni Pule Highway were allegedly racing when one vehicle hit the other at about 1:50 a.m. The Waimea man was in the passenger seat of an Isuzu pickup truck, driven by a 21-year-old Puna woman, that slammed into the other truck, police said. The truck ran off the road and rolled over, officials said. The man, who was wearing a seat belt, was taken to Kona Community Hospital, where he was pronounced dead at 7:05 a.m. The female driver, who was ejected from the truck, was airlifted in serious condition to North Hawaii Community Hospital. The driver of the other truck, Brian Santiago, 33, of North Kohala, was charged with numerous offenses including negligent homicide, drunken driving, driving without a license and racing on a highway. He was held at the Kona Police Station in lieu of $7,000 bail. The other passengers in Santiago's truck, two women and one man, were not injured. This is the 35th traffic fatality on the Big Isle this year, five more than at the same time last year.